Just a quick tip – since Laravel 5.1 now is coming with PSR-2 support (most important change is spaces indent instead of tabs), it makes sense to configure your editor to support that by default, if you haven’t done so already. 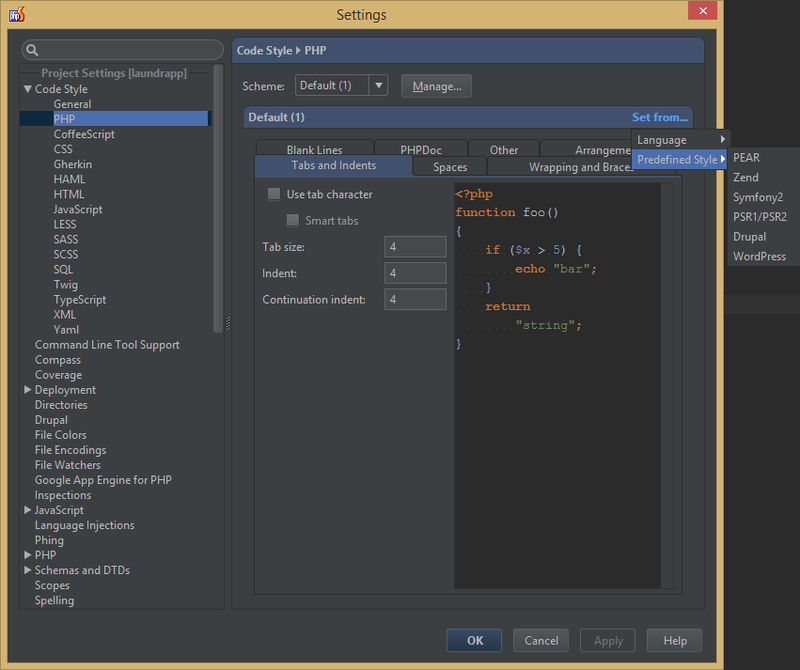 To choose Code Style in PHPStorm, you just to to File -> Settings and navigate to that menu. Just choose PSR1/PSR2 and you’re good to go! Hi! Sry for question, but i don’t know how do it better. So, how is it good/bad to learn 2 frameworks toogether? Yii2 to current time and Laravel for future job? Hi Alejandro, it depends on your current level of knowledge – if you have to LEARN 2 frameworks from scratch, then it’s almost impossible, you will confuse yourself, go for Laravel. But if you know some Yii2 and can work with it, then I would advice to stay with it for a while and learn Laravel bit by bit in your spare time. I had started to work on Laravel, and was looking up questions/answers in Stack Overflow. I found that there were job adverts for laravel jobs that seemed to be localized to my IP address. I found a fine full time job. Thanks for the great post. How would I have known to look in the settings myself I don’t know! By the way comment form validation on this page is broken. I was able to enter an email address in the website field!